One of the most talented, experienced and reliable Cricketer from Saurashtra. He has played Saurashtra Ranji Trophy Team for 22 years since 1992 till 2014. He has been captain of Saurashtra Ranji Team for seven years. He is sixth highest run scorer in Ranji Trophy Cricket history by scoring 7607 runs. He has played 130 first class matches and scored more than 8000 runs with 15 centuries and 55 fifties. He has been important part-time bowler too. He took 70 wickets in first class matches. He is holding a record of sixth longest inning in first class cricket history in the world batting over 13 hours. He represented Board President XI against Pakistan Touring team in 1998. Toured West Indies with India A team in 1999. Represented India A in Challenger Trophy at Bangalore in 2000. 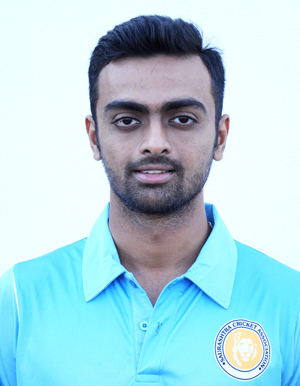 He has played remarkable innings in matches of Irani Trophy, Duleep Trophy and Deodhar Trophy. He has played in the UK as an overseas professional player. Apart from his remarkable career as Cricketer, he is excellent Coach. He is head coach of Saurashtra Ranji Trophy team since 2014. He has been Level B Coach of BCCI. He has also been Level 2 Coach of England and Wales Cricket Board (ECB) since 2009. He is also Coach of Bharat Petroleum Cricket Team for last 2 years where upcoming players of India and India A like Manish Pandey, Pragyan Ojha, Sanju Samson, Abhishek Nayar, Suryakumar Yadav etc have been having coaching under him. He is also Asst.Coach in IPL-2016 for Gujarat Lions.